For 200 years, the Knights Templar were a powerful political and economic force, helping to shape Europe during the Middle Ages. Founded to protect pilgrims on their journeys to the Holy Land, the "poor comrades-in-arms of Christ and the Temple of Solomon" would eventually grow a network of strongholds ("Commanderies") throughout the Christian world, where novice knights were trained, and trade goods could be managed and exchanged. By 1307, the 'poor comrades-in-arms' were one of the richest organizations in Europe: one that would attract the covetous eyes of the French king. 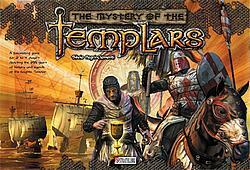 In The Mystery of the Templars, players become the masters of this secretive organization. They must assign their knights to the critical task of escorting pilgrims, but also to seek out and discover long-lost artifacts of Christian lore. Using their holdings in the Holy Land, they procure valuable trade goods, which must then be transported to the hungry markets of Europe, using the profits to expand the Order’s holdings. But along the way brigands and pirates threaten the flow of goods and wealth, and must be challenged by valorous knights to safeguard the precious caravans and trade ships. To be successful, the players must balance the needs of trade, development, and battle. In time, the powerful enemies of the Templars will strike, beginning the Persecution which will eventually cause the destruction of the Order. In those last desperate days, the players must flee from their Commanderies with all the wealth and relics they can carry, seeking refuge in the farthest corners of the world. The player who can best manage the resources of the Order during the days of wealth, and who can rescue the most important relics from the Persecution, will be the victor in The Mystery of the Templars.